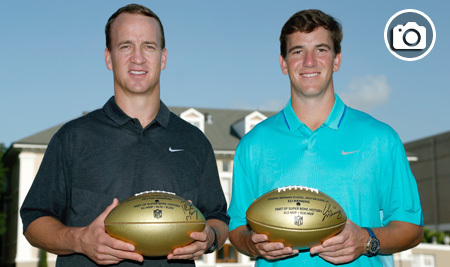 Week 2:Marcus Allen, Terrell Davis deliver golden footballs. Week 3: Peyton and Eli Manning surprise high schoolers during workout. Week 4: Bill Cowher addresses the Carlynton High School football team. Week 5: Robert Mathis returns to his roots at McNair High School. Week 6: Keenan Lewis brings the past to the present in hometown of New Orleans. Week 7: Jerome Bettis surprises his elementary school in Detroit with a golden football. Week 8: Troy Brown brings back three rings and a golden football to South Carolina. Week 9: Boomer Esiason returns to high school after nearly four decades. Week 10: Jim Kelly never forgets his Pennsylvania hometown. Week 11: Sanders and Kearse visit old stomping grounds. Week 16: Plunkett's Bay Area roots. Week 16: Coming Home to Raines. We’re all just a kid from somewhere, and that’s hitting home for some Super Bowl champions. Players and legends such as Terrell Davis, Marcus Allen, Bill Cowher and Boomer Esiason are among those who have participated in the NFL's Super Bowl High School Honor Roll program. As part of the nationwide Super Bowl 50 celebration, the NFL started the Super Bowl High School Honor Roll program to acknowledge schools and communities that have directly influenced Super Bowl history and impacted the game for the better. High schools across the country, and around the globe, will be given a Wilson Golden Football for every player or head coach who graduated from the school and was on an active Super Bowl roster. More than 2,000 high schools and roughly 3,000 players and coaches will be recognized this season. Players and coaches will have chance to deliver the commemorative footballs personally. The highest number of golden footballs a state will receive is California with 432. Following California on the list is Texas (326), Florida (218), Ohio (155) and Pennsylvania (148). California also has the mark for most high schools receiving golden footballs with 296. Texas is second with 223 and followed by Florida (141), Pennsylvania (124) and Ohio (119). Memorial High School in Port Arthur, Texas, will be honored as the school to receive the most golden footballs with eight. The NFL Foundation, which gave $1 million for the campaign, will also provide schools with the opportunity to apply for grants of up to $5,000 to support their football programs, along with a new character education curriculum. Super Bowl High School Honor Roll is an initiative developed by the NFL to recognize schools and communities that contributed to Super Bowl history and positively impacted the game of football. High schools across the nation, and around the world, will receive a commemorative Wilson Golden Football for every player or head coach who graduated from their school and was on an active Super Bowl roster. Nearly 3,000 players and head coaches, and more than 2,000 high schools, will be recognized. Players and coaches will also have the opportunity to personally deliver golden footballs. The NFL Foundation will provide the schools with a new character education curriculum and the opportunity to apply for grants of up to $5,000 to help support and grow their football programs. The NFL Foundation has invested $1 million towards the campaign. More than 2,000 high schools recognized. California will receive 432 golden footballs, marking the highest number of golden footballs a state will receive. Top five states include: California (432); Texas (326); Florida (218); Ohio (155); and Pennsylvania (148). The state with the most schools receiving golden footballs is California with 296. Top five states include: California (296); Texas (223); Florida (141); Pennsylvania (124); and Ohio (119). The New England Patriots have the most players and coaches (current and former) being honored with 256. Top five teams include: New England Patriots (256); Pittsburgh Steelers (215); Denver Broncos (210); San Francisco 49ers (197); and New York Giants (190). Out of all of the players and coaches being honored, 129 are in the Pro Football Hall of Fame. The New England Patriots have 44 current players who will be honored in the program – the most of any team. The top three teams with current players being honored: New England Patriots (44); Seattle Seahawks (43); and Denver Broncos (23). There are 16 current head coaches being honored for either playing or coaching in a Super Bowl – Baltimore Ravens, Carolina Panthers, Chicago Bears, Dallas Cowboys, Denver Broncos, Green Bay Packers, Kansas City Chiefs, New England Patriots, New Orleans Saints, New York Giants, New York Jets, Pittsburgh Steelers, Seattle Seahawks, St. Louis Rams, Tampa Bay Buccaneers and Tennessee Titans. Memorial High School in Port Arthur, Texas will receive eight golden footballs, marking the most a high school will receive. Five schools will receive six footballs, 14 schools will receive five and 16 schools will receive four. American Samoa, Austria, Australia, Canada, Cyprus, Germany, Mexico, Norway and the United States are the eight countries and one U.S. territory represented in the program. Aside from the United States, Canada will receive the most footballs with 15. Forty-eight out of the 50 states will receive a golden football. Maine will receive one, marking the fewest number of footballs a state will receive. New Hampshire and Vermont are the only two states to still yet produce a player or head coach of a Super Bowl team. © 2015 NFL Enterprises LLC. NFL and the NFL shield design are registered trademarks of the National Football League.The team names, logos and uniform designs are registered trademarks of the teams indicated. All other NFL-related trademarks are trademarks of the National Football League. NFL footage © NFL Productions LLC.